Esco recently acquired a National Environmental Balancing Bureau (NEBB) Australia Certification on Cleanroom Performance Testing of Cleanrooms and Cleanroom Systems. Likewise, Poh Seah Seow, Esco Service Manager, is named as NEBB Certified Professional. Esco and Mr. Seow are recognized as highly skilled specialists who are able to measure the efficiency of building systems and provide customized solutions for business owners. 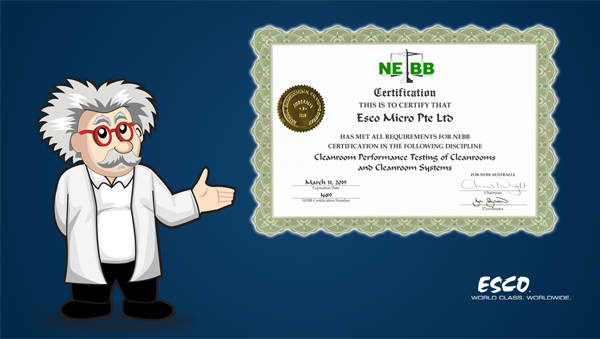 NEBB certification is a tangible proof of qualification to perform our work in accordance to NEBB Procedural Standards. This is another proof that Esco maintains high standards and upholds our promise of being an Excellent Service COmpany.